There are far more delicious offerings to be had at sugar shacks than syrup or the perennially predictable sugar-on-snow. Mainly, lots and lots of pork, including a crunchy little snack the Québécois call "les oreilles du crises," or "the ears of Christ" in English. Caveat: A border crossing is required. While residents of the U.S. tend to associate maple with Vermont, Québec actually produces more than 70 percent of the world's maple syrup. According to Les Cabanes à sucre du Québec, a tourism organization, the province has more than 200 cabanes à sucre — sugar shacks — many of which serve banquet-style Québécois feasts during the sugaring season. Such meals primarily consist of pork-laden comfort food, but some sugar shacks have their own variations. La Maison amérindienne in Mont-St-Hilaire serves maple-infused contemporary indigenous food, while Au Pied de Cochon offers upscale meals at its sugar shack in St-Benoît de Mirabel. A few cabanes serve vegan options; still others broaden the maple experience and offer live music, dancing, sleigh rides and other activities for kids and tourists. For my taste of cabane culture, I headed to Érablière Hilltop in Dunham, located in the Eastern Townships fewer than 10 miles from the border. 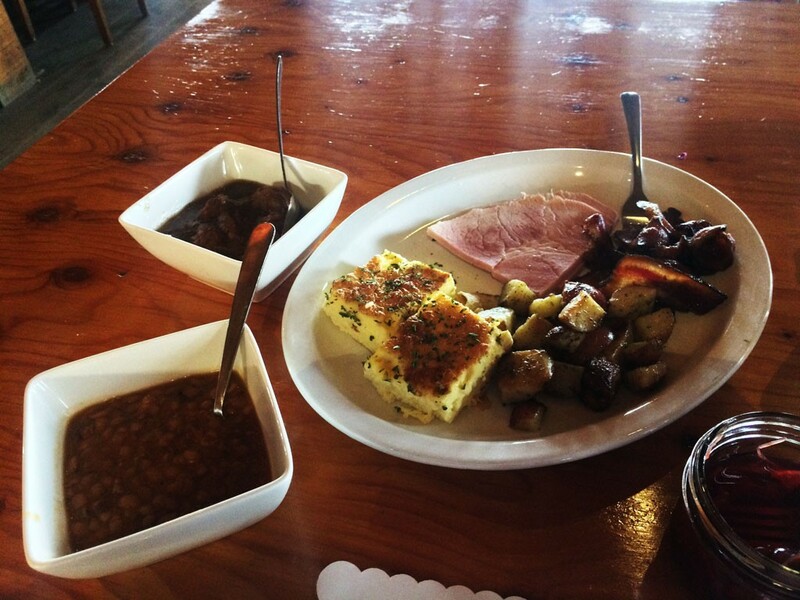 The sugar shack's half-English name speaks to Dunham's mixed heritage. Originally inhabited by Abenaki, who were making maple syrup long before their first contact with Europeans, Dunham was settled by English Loyalists in 1796. The first township of Europeans established in lower Canada, Dunham is populated primarily by francophones, though anglophones are still common in the area. Québec has featured banquet hall sugar shacks since the 19th century; Érablière Hilltop's first one was built in 1986. The current cabane à sucre, built in 2000, sits on a cliff buttressed by a 100-acre sugarbush. Its interior is decked in wood from the floor to the cathedral ceilings. A window in the dining room showcases the maple syrup production facility below. 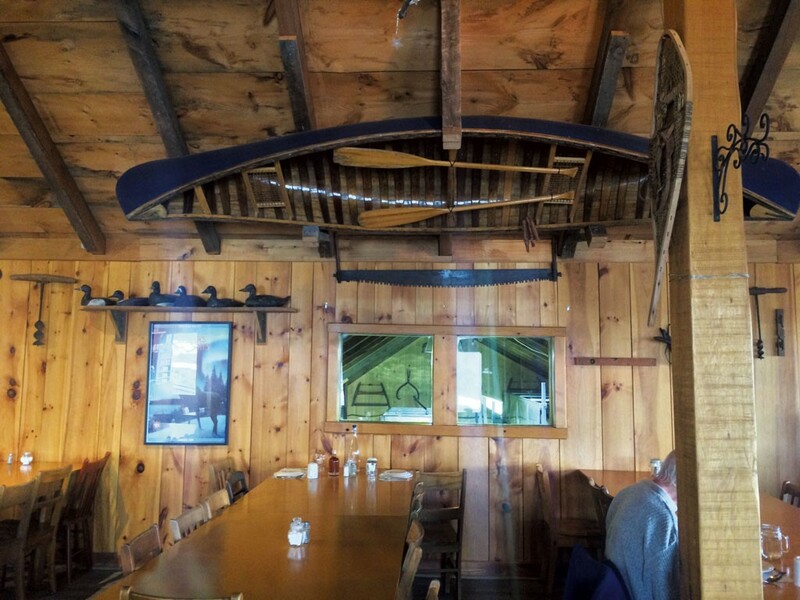 A large wooden canoe hanging from the rafters alludes to the Québécois legend "La Chasse-Galerie," in which loggers make a pact with the devil to travel to their faraway sweethearts via an enchanted flying canoe. One big draw of Érablière Hilltop is the view from the large deck. Mont Brome, Mont Yamaska, the town of Rougemont and an 1832 stone house are all in its dramatic vista. Owner James Bond said the sugar shack serves about 600 guests per week, the majority on Saturday and Sunday. Why don't Vermont's sugar shacks feed such hungry throngs, instead limiting themselves to serving sugar-on-snow, coffee or the occasional breakfast? Michael Lange, an anthropologist and professor at Champlain College, explains that the more open terrain, larger scale of production and "bigger catchment area of neighbors" historically made Québec sugar shacks better suited to feeding large groups. In Vermont, maple festivals tend to be the method of choice for celebrating the running sap while drawing tourists. Earlier this April, though, La Garagista Farm + Winery brought in a guest chef for a pop-up, one-night-only Québécois-style sugar shack dinner in Bethel — for $200 a person. Prices are less steep at Érablière Hilltop, where a Friday discount brought in a handful of locals, a Québécoise friend and me. The four-course set menu (26.95 to 31.30 Canadian dollars) began with cretons, a pork spread similar to a rustic pâté, which we smeared on crusty rolls made in neighboring Cowansville. 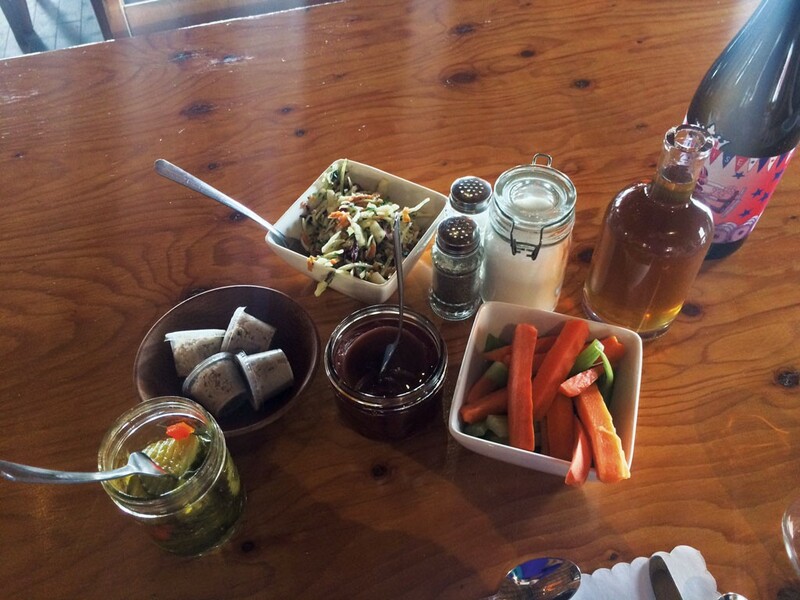 We also feasted on jars of pleasantly homey pickled red beets and sweet cucumber and red pepper pickles. The lively cabbage slaw was made with a light vinaigrette and fresh cilantro. I giggled at the crudités — the rough carrots looked like they'd been hacked by a frustrated child with a dull knife. Our second course included a light and smoky pea soup and oreilles de crisse. Thick, curly and brittle, the salty fried pork rinds bore little resemblance to their packaged counterparts. I cracked a few of them on top of my soup for an effect similar to bacon bits. We washed the course down with La Sottise Réserve, a saison aged in chenin blanc barrels. The sugar shack is BYOB, so I'd picked up the beer at nearby Brasserie Dunham, a microbrewery with its own pub and restaurant. The saison's bright acidity cut through the food's richness, though a slightly funky cider would have paired just as well. "You are damn lucky, girl," said my friend when the waitress set down a ragout of meatballs and pigs' feet. "This is Christmas food," she added. Savory and seasoned with a bit of clove, the dish takes three days to make. Continuing with Pork Fest 2019, the fèves au lard were tender white beans baked with lard and a touch of maple. I ate them with slices of white ham and thick-cut, deliciously chewy pork jowls. Bond said Érablière Hilltop sources its pork from a farm in Stoke, Que., and smokes its meats in-house. This course also included herbed red potatoes, parboiled before roasting and sweet and creamy. I continued to visit the pickles, needing vegetables for a slight counterbalance to the pork fat. A thick, fluffy omelette was light in comparison with the other dishes. "This could be meat pie instead," my friend said with a touch of disapproval, preferring the dish she associates with Québécois family feasts. I, by contrast, felt no lack of meat, but I was ready for something sweet. We poured a bit of very light amber syrup onto the omelette, transforming it into a makeshift flan. I had given up desserts for Lent, but, in the spirit of gluttony, journalistic integrity and wanting to get everything I'd paid for, I dug into many that night. First transgression: maple dumpling. Bond said these tender carb concoctions were historically prepared in the woods by sugarers. Made easily from flour, eggs and water, they were boiled in a mix of syrup and water. The pudding chômeur — unemployment collector's pudding — was a sort of bread pudding served with a thick, buttery maple sauce. I had a café allongé — and then, because it was included and I needed to fuel myself for dancing stateside later, a second allongé, along with a slice of maple pie with a flaky housemade crust. Our sweet finale was the inescapable sugar-on-snow, which our server prepared outside on a machine that looked like a cross between a miniature hockey rink and a grill. If I hadn't needed to drive home, I would've had it with a swig of whiskey and made a toast to the running of the sap. Érablière Hilltop, 4329 Chemin Symington, Dunham, Que., 450-295-2270, erablierehilltop.com. The original print version of this article was headlined "Sweet Meat | A Québécois maple feast at a cabane à sucre in Dunham"